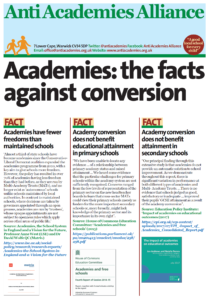 40 of the 45 highest excluding schools were academies or free schools. Is this how ‘success’ is achieved? 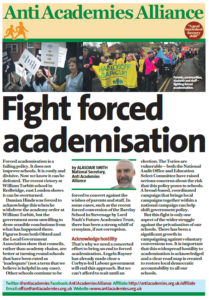 How much more evidence is needed before policy-makers accept that academisation isn’t the answer (but a large part of the problem)? A broken system. The government has been urged to address “deeply concerning” rates of exclusion in England’s secondary schools after a Guardian investigation revealed dozens had suspended at least one in five of their pupils. 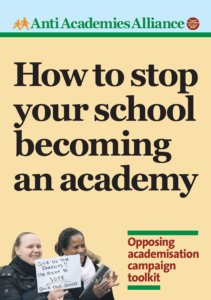 Of those 45 schools handing at least 20% of their pupils one or more fixed-period exclusion in 2016-17, the overwhelming proportion were academies, with one of them, the Outwood academy Ormesby in Middlesbrough, excluding 41%. Five were run by local authorities and six were free schools.